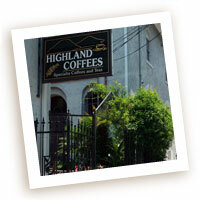 Highland Coffees is located at the North Gates of LSU — Highland at Chimes. Our shop faces West Chimes Street. Bengals and Bandits is immediately to the east of us, and Reginelli’s is just to the west. The Chimes restaurant and the Varsity Theater are right across Highland Road. We are approximately two miles south of Downtown Baton Rouge. Simply take Highland Rd. south towards LSU about two miles through historic Old South Baton Rouge. Take a right on W. State St. and follow it around as it becomes Lake St., and come up W. Chimes St. back towards Highland Rd. Highland Coffees will be the last shop on the left. Look for our wooden sign and the wrought iron gate. Take I-10 West and get off at Dalrymple Dr., Exit 156B. Go south on Dalrymple Dr., circling back under the Interstate overpass, heading towards LSU. Follow Dalrymple Dr. about 1/3 of a mile to the traffic light at E. State St. Turn right. Go down State St. past Highland Rd. until it turns to the left and becomes Lake St. Follow the street around, and come up W. Chimes St. back towards Highland Rd. Highland Coffees will be the last shop on the left. Take Highland Rd. through the LSU campus until it comes out the other side at the North Gates. Since W. Chimes St. is a one way street, go down one block to W. State St. and turn left. Follow W. State St. around as it turns into Lake St., and come up W. Chimes St. back towards Highland Rd. Highland Coffees will be the last shop on the left. Take I-10 East (the new Mississippi River bridge) to the Highland Rd. exit, number 155A. Go south on Highland Rd. towards LSU about two miles through historic Old South Baton Rouge. Turn right on W. State St. (at Smoothie King) and follow it around as it becomes Lake St. and then W. Chimes St. Go up W. Chimes St. back towards Highland Rd. Highland Coffees will be the last shop on the left.